Preheat oven to 350 degrees F. If you have it, place an uncoated metal cooling rack inside a foil-lined large rimmed baking sheet and lightly coat with cooking spray. If not, line a baking pan or broiling pan with foil and lightly grease with nonstick cooking spray. Cut the chicken breasts into large bite-sized pieces. If using chicken tenders, cut them in half (you can fold over the chicken tender pieces when wrapping so they'll be thicker). Place the chicken pieces in a medium bowl and toss with the salt, pepper, oregano, thyme, garlic powder and red pepper. Let it hang out while preparing the rest of the ingredients (you can cover and refrigerate up to a day). In a small bowl, mix the brown sugar and chili powder together. Cut the entire slab of bacon into thirds. Wrap each chicken piece with small strip of bacon and holding tightly, dredge them in the brown sugar/chili powder mixture. Place the chicken pieces in a single layer on the baking sheet (or rack set inside the baking sheet). If the bacon isn’t staying put, you can secure with a toothpick. 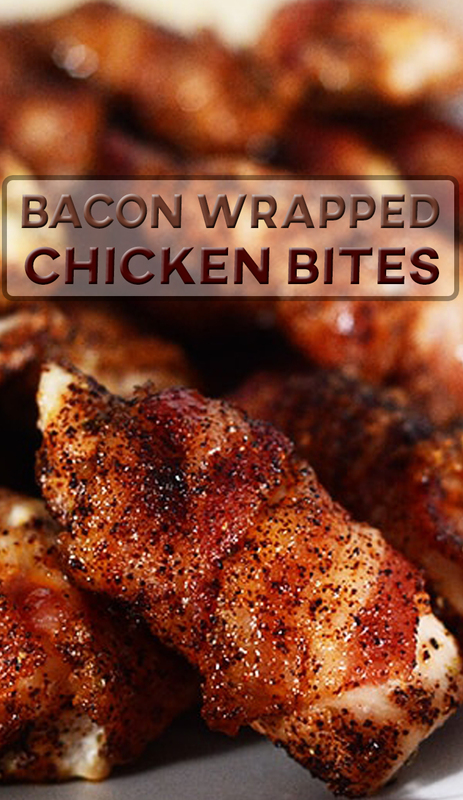 Bake for 20-25 minutes or until the bacon is crisp and the chicken is cooked through. Flip it once if the chicken is laying directly on the baking sheet. Serve immediately.